International climate change funds are a key vehicle for developed countries to deliver their fast start climate finance commitments as per the 2009 Copenhagen Accord. While these funds have been financing a large number of mitigation and adaptation projects in developing countries in recent years, many funds have not yet committed substantial amounts of fast start-funded resources. This presents an opportunity for developing countries to tap into the remaining resources for investment in urgent adaptation actions. This 2012 report is intended as a background technical assessment for the USAID Adapt Asia-Pacific programme. While adaptation financing can come from multiple domestic and international sources, this assessment focuses on gaining an in-depth understanding of the existing pool of international climate change funds which can provide resources to finance adaptation activities in USAID Adapt Asia-Pacific‘s target countries. Other sources of adaptation financing such as national budgets, private sector finance, philanthropy and ODA etc. are generally not covered in this assessment. In 2012 this assessment was able to identify 11 international climate change funds which are relevant to USAID Adapt Asia-Pacific‘s target countries. This assessment estimates that there is approximately USD 260-500 million of funding available in the multilateral funds system which is open to project proposals from eligible developing countries globally. While the Pilot Program for Climate Resilience (PPCR) is the biggest multilateral fund for adaptation in terms of size, PPCR resources are not included in the above estimates because the fund is not openly available to developing countries globally. Bilateral funds also have substantial uncommitted resources though the exact total amount is unknown. Access mechanisms vary across the funds. For the multilateral funds, indirect access through multilateral institutions remains the norm, with the exception of the AF which reserves 50% of its resources for direct access by national implementing entities (NIEs). On the other hand, the bilateral funds use government-to-government consultations as a principal means of programming fund resources, in addition to contributing part of their resources to the multilateral funds. While both the multilateral and bilateral climate funds principally provide support in the form of grants, developing country recipients are often required to leverage investments by MDBs to co-finance projects with the grants. Agriculture, water resources, coastal management and disaster risk reduction figure prominently as priority sectors which have received most financing from the funds to date. Low income countries, least developed countries (LDCs) and small-island developing states (SIDS) are priority recipients for most funds. The international climate funds complement other resources, including official development assistance (ODA) and government budgets, as important sources of adaptation financing in developing countries. However, gaining access to them can pose difficulties for developing country project proponents. Many developing countries lack the expertise and trained personnel to design adaptation projects and prepare the sophisticated technical proposals the funds require. This assessment found that key technical gaps in adaptation project preparation and proposal development exist in the following areas: the design of concrete actions with clear adaptation benefits; the cost effectiveness of proposed interventions; the development of appropriate project implementation arrangements; the mechanism to ensure sustainability of project outcomes; and the avoidance of duplication of efforts with other ongoing initiatives. 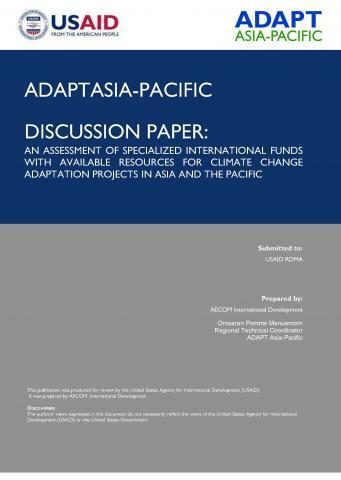 USAID Adapt Asia-Pacific (2012) An Assessment of Funds with Available Resources for Climate Change Adaptation Projects in Asia and the Pacific. USAID Regional Development Mission for Asia: Bangkok, Thailand.